For use with EZRackPLC Bases. 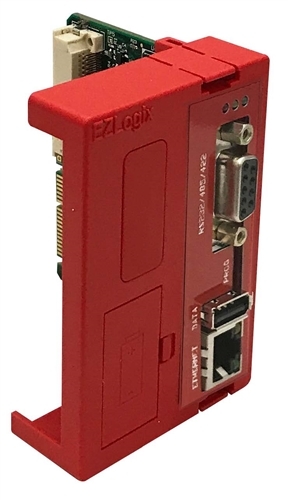 EZRack PLC CPU, 500K words ladder memory, 1 RS232/422/485 Serial Port, 1 Ethernet Port, USB (Data Logging & Programming), IIoT Ready. Free EZRack PLC Designer Pro Software - Download Here. No activation key required. Not a Demo version! I purchased the online special EZ Rack PLC Starter Kit and it's great! Great product. I'm impressed and plan to use the EZ Rack PLC on our 100kW wind turbine prototype that we are building and will install next year. Great product, love the simulator feature without buying the hardware we can try our logic...I would definitely recommend this product!! I have spent some time reviewing the manuals and look forward to working with the first unit just purchased! My favorite "new" software additions are the Ramp & Scaling functions. Also the override feature for outputs.... The HVAC portion of my business just got easier! I eagerly await being able to sell the MQTT function, as I am working with a client, now, integrating electric smart metering.